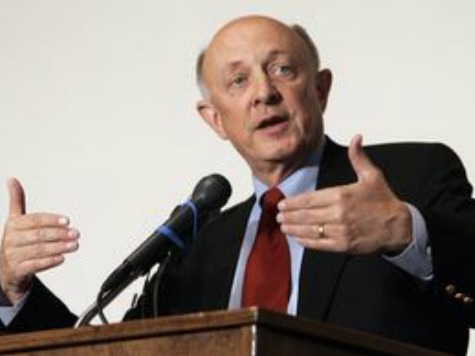 After speaking to the Financial Policy Council at the City University of New York, former CIA director R. James Woolsey spoke briefly to Breitbart News about the post-Cold War security outlook and the highest ranking Cold War-era defector to the United States. Woolsey said that, shortly after the end of the Soviet Union, a “rich trove of material” was brought to the US, with Russian permission. “Most of it was not classified, but was very useful”. By the end of the 90s, the KGB were largely back in control of Russia. In his speech, Woolsey focused on the threat of a natural or Nuclear Electromagnetic Pulse (EMP) to our electric grid, and the need for America to compete in the oil market. He told the audience that Americans must force congress to upgrade the electric grid, and, during the Q&A session, recommended the book Petropoly by Anne Korin and Gal Luft for ideas on how to address the latter problem.